The book has a lot of promise to hit the spot. 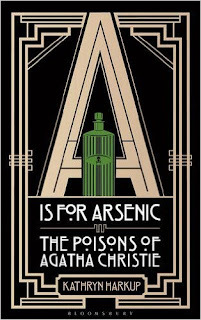 If, like me, you are interested in both science and crime writing, a study of the poisons used in Agatha Christie's books seems a natural fascinator. Kathryn Harkup takes us through a whole range, from familiar favourites (as it were) like arsenic and strychnine to more unusual possibilities like nicotine, phosphorous and ricin. Each poison has its own section, where we learn how Christie used it, how the poison works, what's an antidote (if anything), real life examples of using the poison and then return to Christie for more details of the way that the poison fits with her plots. We start with some really interesting biographical material on why Christie was so good on the subject of poisons (she was trained as a pharmacist's dispenser), and once we settle down into the individual poison sections there is some genuinely fascinating material, particularly in the real life poisonings. But the repeated format does become a trifle tiresome after a while. This particularly applies to the bits that describe how the poison attacks the body (which can be somewhat repetitious) and also when Harkup describes the Christie plots - not because these are spoilers (though sometimes they are), but more because descriptions of novel plots are almost always tedious to read. I am reminded of the two different ways books have approached the elements of the periodic table. Some work through element by element - and reading such titles gets to be a bit of grind. But others, notably Sam Kean's excellent The Disappearing Spoon, are story driven and meander around without the same rigid structure. That approach is so much better to read because even non-fiction books need a narrative to be readable, and an encyclopedia-like repeated format can't deliver that. So there's nothing wrong with this book. It is beautifully made - one of the most elegant popular science books I've ever seen with a gorgeous textured cover and elegant chapter heading graphics. And Harkup combines some interesting stories of real life poisoning with a generally light and highly readable tone. But the format naggingly gets in the way of this being a true popular science masterpiece. All Agatha Christie fans, and many with an interest in poisons and true crime will enjoy the book and will want it in their collection, but it could have been even better.